Is there a chemical in our brains that makes us trust others? And what determines when this does – or doesn’t – happen? Decades of research into the neuroscience of trust have answered some of these essential questions – and understanding it all can help you become a trusted expert on trust. Considering the results of two recent global surveys on how organizational trust impacts employees and the organization, the neuroscience of trust is something every leader should understand. Let’s start with the most basic. The brain chemical oxytocin is our brain’s way of signaling trust. Neuroeconomist Paul Zak at Claremont Graduate University has led some fascinating experiments to prove that oxytocin is the brain’s trust chemical. 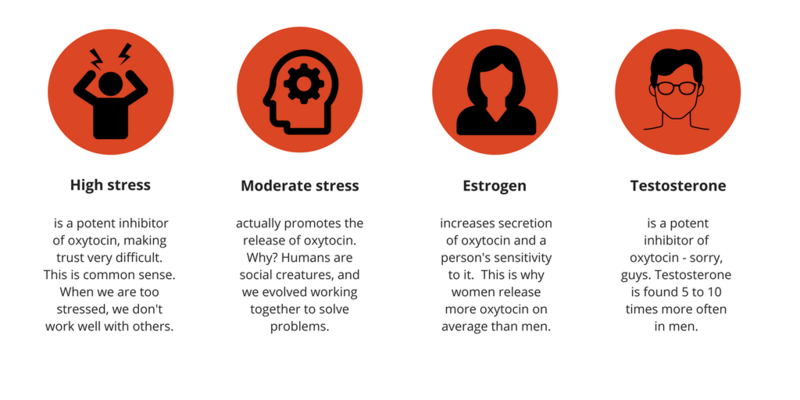 In his experiments, the amount of oxytocin produced predicted both how much the participants trusted others and how trustworthy they were. To prove that it wasn’t due to some other chemical or hormone, Zak and his team did another round of experiments in which they injected participants with synthetic oxytocin – and, sure enough, oxytocin was the cause: It significantly reduced the fear of trusting strangers. We all have a sense that yeah, trust is probably kind of important to have at home and at work. 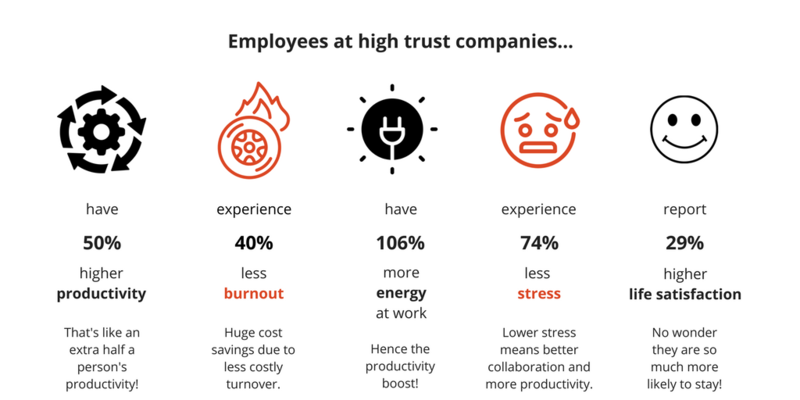 But according to two recent global surveys of workplace culture, it turns out trust is nothing short of a game changer, for the organization and its employees. The following data on employees at high trust companies is from the research of Paul Zak, as outlined in his new book, Trust Factor: The Science of Creating High-Performance Companies. But, it turns out, there isn’t exactly consensus on what level of trust exists at a given company. One of the most fascinating findings of Six Seconds’ global workplace survey is that leaders tend to overestimate trust. When asked to score the phrase, “Leaders here are sincere,” which is highly correlated with trust, senior managers’ average answer was 21% higher than the average for front line employees. Uh oh. Is your organization doing enough to cultivate trust? Remember you can get our latest white paper, The Neuroscience of Trust, and accompanying slides with speaker notes, by clicking on the button below. That 21% trust gap between senior leaders and front line workers is only one of many fascinating findings from Six Seconds’ global survey of over 1600 employees worldwide. It offers new insights into people and what drives performance. Get the full report today for free by clicking on the download button below. Always interested in the relentless pursuit of the Competive edge. Look forward to reading your work in contrast to others i.e. Lou Tice from Pacific Institute. What are “the two recent global surveys of workplace culture” for the stats you cite re: employees at high trust companies? Hi, George. I apologize that the two sources were not very clear. I have now made it clearer in the article. The first statistics are from Paul Zak’s research as outlined in his book, Trust Factor. The data below that on the trust gap comes from Six Seconds’ global workplace survey, and that can be found in the hyperlink in the article. Thanks for reading! Great news! Now we have scientific data to drive the construction of trust! I believe we are naturally “truster” but in many ways our culture creates a belief that “the other” is not to be trusted! “Do not trust the unknown!” And more over we create companies that trusts the culture of the self super man and women. We need to create cultures where the unknown is attractive and where the team/group work are recognized instead of the individual one! Note... if you don't receive the email with the attached quiz and slides within 10 minutes, please check your spam folder, or contact us.